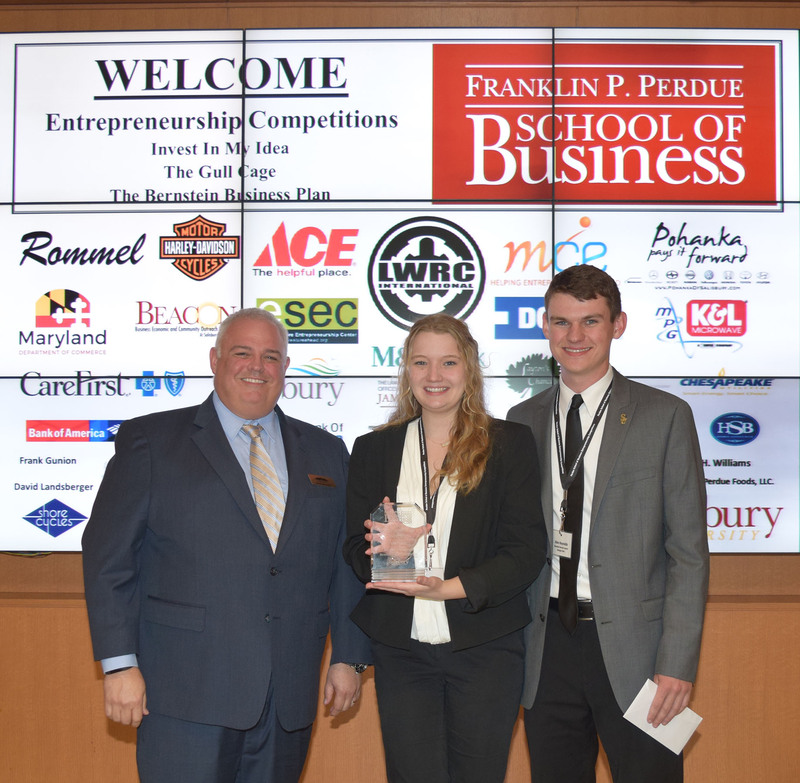 Together with her partner Allen Reynolds, the two submitted a student business plan as part of the school's annual entrepreneurship competitions. They were awarded $24,000 to implement their idea for Reynolds Rentals, an upscale storage facility, on a need they observed in Reynolds’ hometown of Smithsburg, MD. Cambridge has enjoyed a productive partnership with Salisbury University since our inception. In addition to an ongoing role as an active host site for undergraduate and graduate interns, we've hired many Cambridge team members over the years - including our President & CEO Tracy Tyler, Human Resources Manager Ashley Church and even yours truly (B.S. Education 2004; MBA 2006). Katherine's achievement as a valued member of Team Cambridge has underscored our pride for both our emerging professionals and our alma mater. If one of the first laws of business is supply and demand, Salisbury University students Allen Reynolds and Katherine Hairsine are following that law to the letter. The homeowners association (HOA) at a large development near the proposed site (a tract of land inherited from Reynolds’ grandfather) recently changed its bylaws to make working on and storing boats and vehicles in driveways illegal. Because many of the homeowners also are avid motorcycle, boat, and antique and classic car owners, the new rule has presented a problem: Where do they perform the routine maintenance required for the upkeep of such precision machines? Reynolds, a sophomore business management major, and Hairsine, a senior international business and marketing major and member of SU’s 2013 freshman Business Living Learning Community from Glen Arm, MD, began thinking about storage units. Currently, the only storage unit in Smithsburg is at 100 percent occupancy, Reynolds told the panel of judges, comprised of area business leaders. Its units also are small, not lit well enough for many maintenance tasks and lack electricity, he said. Enter Reynolds Rentals, a “luxury” storage facility geared toward owners of the vehicles affected by the recent HOA change. At Reynolds’ and Hairsine’s planned facility, these enthusiasts would be able to store their vehicles inside climate controlled units, with plenty of LED lighting and electrical outlets — and perhaps most importantly, few limits on the types of maintenance that could be performed inside. The area also has seen significant population growth in the past two years, said Reynolds, predicting he and Hairsine would have no problem filling the units once built — a task the $20,000 Bernstein Award should help. The prize includes $10,000 from entrepreneur Richard Bernstein and LWRC International, LLC, as well as $5,000 from Rommel Holdings, Inc. and $5,000 in marketing services from the Business, Economic and Community Outreach Network (BEACON) in SU’s Franklin P. Perdue School of Business. In addition to the Bernstein Award, Reynolds and Hairsine received $1,000 plus $2,500 in legal services from the Law Offices of James A. List, LLC as the third-place winner in the competitions’ Gull Cage round, an elevator pitch session similar to ABC-TV’s hit show Shark Tank. They also earned an additional $1,000 as one of 15 finalists in the competitions’ “Invest in My Idea” poster session round for a total prize package of $24,500. In all, a record 50 teams entered this year’s competitions, up from 25 in 2016. Both Reynolds and Hairsine are Perdue School students. To read the complete article - or learn more about the program, visit: www.salisbury.edu.